Two good MLS teams entered Talen Energy Stadium in Chester on Sunday. One dominated possession and played lockdown defense to shut down one of the league’s best strikers. The other walked away with a 1-0 win. 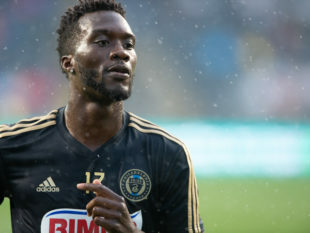 In a game against arguably the best team in MLS, the New York Red Bulls, Philadelphia Union showed nearly all the elements of a team capable of beating anyone in the league. Let’s break down what was missing, because that could be the difference between an entertaining playoff team and a championship team. Philadelphia controlled 66 percent of possession during the match. However, New York got all the quality shots. Take a look at the shot chart for the game. Philadelphia outshot New York in quantity, but not quality. Image: MLSsoccer.com. New York took eight shots. Half went on target. Seven came from inside the box. A weak shot from C.J. Sapong in the 25th minute off a very good look created by a Fafa Picault drop pass. A looped shot from Cory Burke in the 94th minute that basically ended the game. Outside the Minnesota United anomaly — and let’s be honest: that’s a garbage team that played their garbage worst for a half — the Union have lacked a final product basically since the September international break. In their last six games (all competitions) against teams not from Minnesota, the Union have scored four goals. In part, it’s that opposing teams are game-planning specifically to stop the Union’s newly impressive possession game. But there’s more that has to do primarily with the Union themselves. Eventually, opposing defenses catch on to what a team or a player does. They obtain enough game film to develop a sufficient sample size to identify trends. Then they develop their own plan to stop you. You’re either good enough to eventually figure out ways to overcome that, or you’re not. MLS teams have reached that point with Burke, who has now started 14 league games. They’re tracking his movement, preventing free headers in the box that he previously was getting, and generally making his life difficult. Burke has impressed, but he is at the point where he needs to adjust and show he has some more tricks. So do the Union, because this isn’t their only challenge. Borek Dockal has gamely shown up to play for club and country since his ankle injury, and he has still been fairly good. He had four key passes against New York, for example. But he still looks a bit slowed, a bit less aggressive, a bit less dangerous. Ankle injuries don’t heal that quickly. Credit to him for trucking through, but understand this is probably a factor, whether the Union talk about it or not. The reemergence of the Union’s scoring problems roughly coincided with his injury. For all the talk about New York’s great defense — and no question, it’s quite good — keep in mind that they were playing without starting left back Kemar Lawrence and left attacking midfielder Daniel Royer. Each is among the best in MLS at his position. Each was replaced by a player playing out of position. The attacking threat from the replacements was minimal. The Union should have been freed from some defensive concerns to flood down their favored right side against the replacements. They created few quality shots on that side, however, as has been the case for most of the last six weeks, in large part because C.J. Sapong looks like a player with zero confidence in attack. His 25th minute shot was exactly the sort of opportunity we’ve seen him get a few times in recent months, a weak effort from a player shooting out of obligation more than because he thinks the shot might actually go in. While he can put in a gamer’s effort as a target winger, the fact is that we’ve had enough evidence over his stints in both Kansas City and Philadelphia to know that he offers only so much in attack as a target winger. Bottom line: Sapong rarely threatens defenses these days, at any position. This allows opposing defenders off the ball to sink in on Burke and Fafa Picault, each of whom has often dominated one-on-one matchups. Likewise, right back Keegan Rosenberry becomes a less relevant factor on overlaps with Sapong in the game. In comparison, look at opposing defenses when Ilsinho is on the field. He’s a nightmare to defend when fresh, and Rosenberry often runs wild in conjunction with him. New York countered that by putting at least two defenders in front of Ilsinho every time he got the ball Sunday, and even then they were just barely shutting him down. The logical question is whether Ilsinho should return to the starting lineup. The answer is no. He is just too effective off the bench, as well as too injury-prone and fitness-challenged. The Union are better off saving Ilsinho for the last third of the game, when everyone else is tired. Then sit back and watch him break ankles, crack open sunken defenses, and create goals. Other sports have seen the value of bringing top players off the bench. In the NBA, they give out a Sixth Man Award. But you rarely see it in soccer. Union head coach Jim Curtin has seen the wisdom of it, and it’s one of the reason’s he’s in the discussion for Coach of the Year this season. The Union don’t have other options as dangerous as Ilsinho, but both Fabian Herbers and Marcus Epps are probably more threatening in attack than Sapong right now. However, Herbers missed Sunday’s game due to injury, and Epps appears consigned to interminable benchwarmer duty. Since starting eight of 13 matches from May 12 through Aug. 4, Epps hasn’t appeared in an MLS game. Unless Herbers is healthy or Epps emerges from the doghouse, that probably means Sapong continues to start. Sapong’s greatest current value is that he plays good defense until opponents tire and Ilsinho comes off the bench to kill them. Unless Sapong regains his confidence, which seems unlikely at this point, it probably means continued diminished returns. The Union will only play good teams once they reach the playoffs. The Red Bulls are a good team. The Union outplayed them in nearly all aspects of the game but one: the final product. If they want to turn those kinds of matches into wins, the Union need to get something out of their right winger. Sometimes one play turns a game. Alejandro Bedoya’s handball was that play. Nobody questions whether he committed a handball. But was it an unnatural position that gave him an advantage? He was protecting himself from getting creamed mid-air by Cory Burke. That ball would have hit his chest if it didn’t hit his hand, and it would have bounced off him in generally the same way. It’s a tough call that could have been a justifiable no-call. Andre Blake is automatic on penalty kicks. And not in a good way. He has faced eight penalty kicks this year. He hasn’t stopped one. (If a motivated reader with more time than me would be so kind as to check the stats from prior seasons, I think we’ll find that pattern holds true throughout his career.) [Ed. note: Blake is 2/15 on penalties in MLS.] It’s the one chink in Blake’s otherwise impressive bright green armor. Jim Curtin knew it years ago when he replaced Blake with John McCarthy when a U.S. Open Cup match went to penalties, and now we know it too. Fabinho, the third sub not made. The Union had just two attackers available as substitutes, and with time running down, Curtin chose not to make a third sub. It felt like a situation calling out for a late Fabinho entry in place of Ray Gaddis, a right-footed defensive stalwart who offers little on the overlap at left back. That would have been unusual for the Union — in fact, I did a double take when I realized I wrote these words — but it would have been interesting too. No home field advantage. Philadelphia has the worst home record of any playoff team in the league: 9-6-2, 16th in the league. They have the league’s seventh best road record. Given that we’re now hearing Union personnel talk about the poor condition of their home pitch, it begs the question of whether it’s still in the Union’s best financial interest for Talen Energy Stadium to be used for non-Union sporting events. A possession team needs a quality, even pitch. The poor pitch quality could end up helping cost them a home playoff game and the ticket revenues that come with it. The Union could finish 3rd — or 6th. The Union still control their own destiny. A win at New York City FC this weekend secures third place. A draw gets them fourth at best and fifth at worst, depending on whether D.C. United wins at Chicago. A loss could drop them to sixth if D.C. gets a result and Columbus wins. You meant for most of this entire season, right? It is who he is. No, I meant it the way I wrote it. They created a ton of good shots from mid-May through early September. They had the league’s highest expected goals for most of the year, by a lot. Hot Take: If David Accam had been healthy all season, this team would have contended for the Shield. honest question, would picault start on teh opposite side, then? I still go back to that first game of the season where Accam was literally slicing right through the NE Rev defense like it was nothing (Guarantee he reinjured himself in that game). Combine that with Fafa and Dockal’s performances this year and your going to get yourself a lot more goals. Such a shame. I’m with James. Union played a stellar-complete game offensively and defensively and couldn’t put the goddam ball in the net. Its not entirely new. What is new-ish…. I enjoyed watching them because they JUST PLAYED WELL. Addendum– Andre still bails on build out too much but it is getting better and as it relates to MLS– that’s all one can ask for. I said this a day or two ago, but Red Bull is the best defensive team in the league — fewest goals conceded and most shutouts — so it’s not surprising they stymied a squad that has struggled to score all season. I think there’s a good chance the U can beat NYCFC and take that 3rd place spot, but I have very little confidence they can get any results in the playoffs if they can’t figure out how to find the back of the net. Why Curtin didn’t bring Ilsinho out for the final 10 to 15 minutes is a real puzzle. Ilsinho came on in the 63′. Are you saying Curtin gave him too much time? No, my bad. I thought he went unused. Ok cool, was SOO confused. Thanks Pete. Genome modified to produce unpullable hamstrings! THEN clone. The one thing I haven’t hear about the Bedoya hand ball, was it ball to hand or hand to ball. IMO it was ball to hand, and thus not a penalty. Not once did JP or Tommy comment on this. Is this not part of the rules in MLS? I’m quite curios if anyone else saw it the same way. I’ve defended CJ in the past because at the time and the team around him, I thought he fit what the Union seemed to want to do, best. I no longer think that is the case. I also don’t think he’s a winger, nor has he the skill set to play in that position well. Honestly at this point, I see CJ as an USL player and not much more. Maybe I’m being too harsh. Maybe I just saw the light. Agree about the ball-to-hand comment. I don’t think Sapong is a USL player, but rather a spot starter/sub who is a useful bench piece because he can slot into multiple positions and give you a big strong target option who can run decent. He’s way overpaid for that now though. Agree he doesn’t fit our system anymore, at least not as a starter. Ilsinho should start vs NYCFC in place of Sapong period. He draws at least two defenders, connects well with Rosenberry, has great ball handling skills, and wait.. he can finish. To top it off he is just fun to watch. Sapong can always come in later in the game to muscle around tired defenders and play some defense. We need to win this last game to give us a chance to win a playoff game at home. Problem is that I don’t think the narrow field Sunday is a good fit for Ilsinho. If comparing who would be better on a narrow field, I’d suggest that CJ’s horrendous first touch would be more harmful. CJ’s first touch this season reminds me of Zardes’ whenever he wears the USMNT jersey. Seemed we played better and had more chances in the first half. Agree? If so why the let-down? Was Curtin outcoached? Shrewd thought about Dockal’s ankle. The ankle injury and the drop-off in production correlate perfectly, which proves nothing, but still. A probable answer on the right win in two years may be Michee Ngalina. Having seen Ngalina force John Wolniec to remove Connor Lake at halftime in Bethlehem some months ago, I was expecting late to be a weakness Sunday. But he was not. While still signed to the Steel, Ngalina trains frequently with the first team in recent months, along with Faris. Burke has scored once since Dockal’s injury. Bottom line, Alberg was the best striker on this team last year and was pretty devistating against opponents. In Europe he is probably the #10 In most cases, but for the Union, he should have been our number 1 striker. He had the accuracy, percision and intelligence when in front of net and when hitting the target. The Union should have tried to keep him and nurture him to become one of the best strikers in a Union jersey. Now we don’t have that talent anymore and haven’t found anyone close to that so far.